I had a great time teaching holonomic thinking last weekend at Sustentare Business School, and we really went into this question in detail. 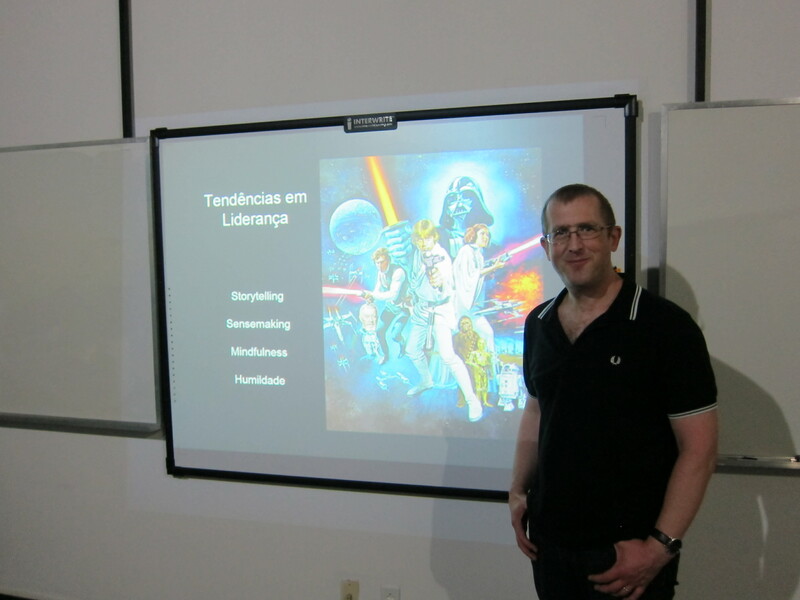 As I think some of you will have seen, I have been using Star Wars recently to discuss the way in which leaders need to understand the path from data to wisdom, and this path takes in storytelling, sensemaking, mindfulness and humility. So unlike Bertrand Russell who only wants us to deal with the facts, for me I would side with Hock who takes a much more fluid way of thinking about reality and the world, in order to imagine how things could be in the future. 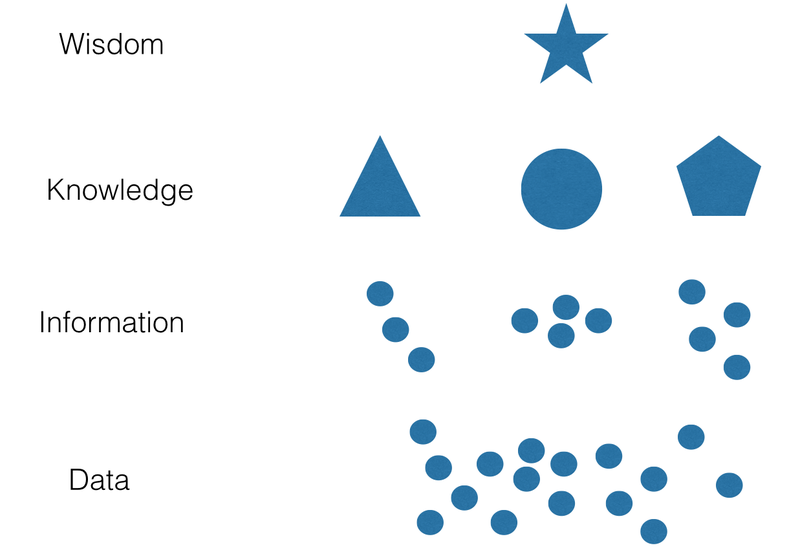 In thinking about intelligence, we can consider the well-known pyramid of knowledge. In this story, we start with a collection of data. This data is then processed into information, this information is then analysed which leads to knowledge, and this knowledge is then studied which leads to wisdom. 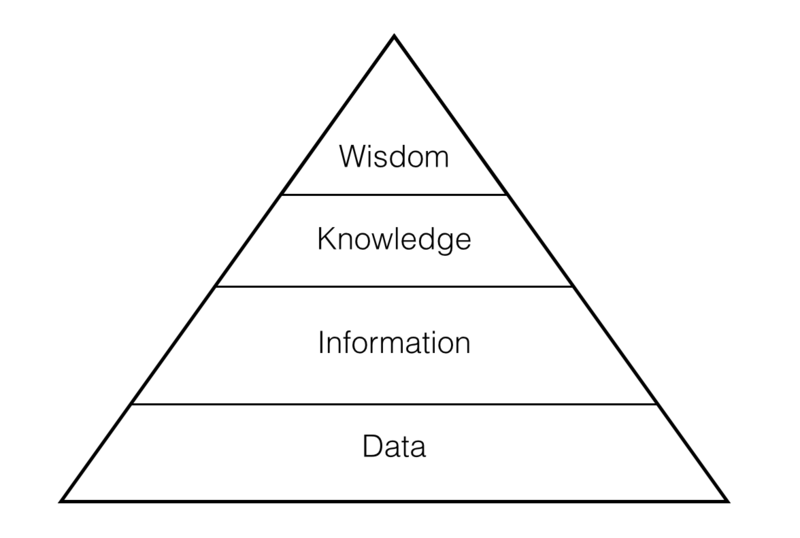 However, this way of depicting the path from data to wisdom misses some important aspects of the way in which we process information. The biggest problem we have in organisations is the fact that as humans we pay attention to different aspects of reality based on how we imagine reality to be. So when faced with a wide array of data, our backgrounds, assumptions and world views will filter the data so that we focus on different patterns. (There is also a huge parallel story of people who collect data but think they have information, people with lots of information who think they have knowledge, and people with plenty of data, information and/or knowledge who are convinced that they have achieved wisdom, but whose actions in life fall mightily short of the words they speak. But this is a separate story to where I need to take this article). To make this more concrete we can imagine a large and complex IT project which consists of many different stakeholders from different organisations. Large IT projects not only have business owners, but also project managers, technical designers, programmers and outside consultants. The reason why many complex IT projects either fail or are delayed at great expense is that different members of the project team fail to come to a unified understanding of what the requirements of the project are, at what stage the project has reached and what now needs to be done. In the UK, in early 2014 the BBC (British Broadcasting Corporation) announced that it would have to abandon its Digital Media Initiative (DMI) at a cost of £98.4m last year. This caused a huge outcry amongst MPs angry at such a waste of taxpayer’s money. Rural payments agency (subsidies to farmers) spent £32 million on a failed system. They then rehired the same IT company to do more work. HMRC (UK tax office) spent £9 billion on an IT led change. 2m pay have paid too little tax, 4m people have paid too much. 160 out of 9,000 health organisations are using a new patient record system costing the NHS £12.7 billion. The command-and-control logic of western high-volume manufacturing creates huge amounts of waste in organisations, as management separate the management of work from a workforce who actually do the work. But when an organisation, or a complex ecosystem of stakeholders manages to achieve a unified vision and instil a shared purpose across the whole organisation the results can be remarkable. Sensemaking began in the world of human computer interaction to study the way in which people understood the technology they were being asked to use. It then spread to organisations, and there are now a range of methodologies to help people understand the way in which we frame situations differently, and therefore understand the same situation or scenario differently. One example of sensemaking software is Sensemaker® developed by Cognitive Edge. The starting point for understanding Sensemaker® is based on the insight that people primarily make sense of the world through telling stories, and not through analysis. Although people tell stories, they rarely tell fully constructed stories. Rather, when people engage in conversation, they do so by sharing fragmented narratives, such as anecdotes shared around a water cooler at work, or the swapping of memories at a family reunion. Sensemaker® attempts to capture these fragments of narratives, as these are the fundamental way in which we communicate, learn and perceive the world. These narratives form a hugely valuable set of research data, and therefore must be captured in the field in their original form. Computers should not capture and analyse this data since semantic analysis is limited due to the flexibility of language. And neither should experts interpret the data, since as we have already seen, people are limited due to cognitive and cultural bias. Sensemaker® allows the person providing the data to decide what it means. So for example, a traditional questionnaire may ask a question such as “are you consulted at work on a regular basis?” The answer that comes back will be an average answer based on months of experience. Sensemaker® is different in that instead of asking questions, people are asked to provide anecdotes, each of which is a discrete item, and then to signify that these mean. In the example below, people are asked a question about leadership behaviour, and in giving them three dimensions, they are forced to think more about their response than just being given two dimensions. 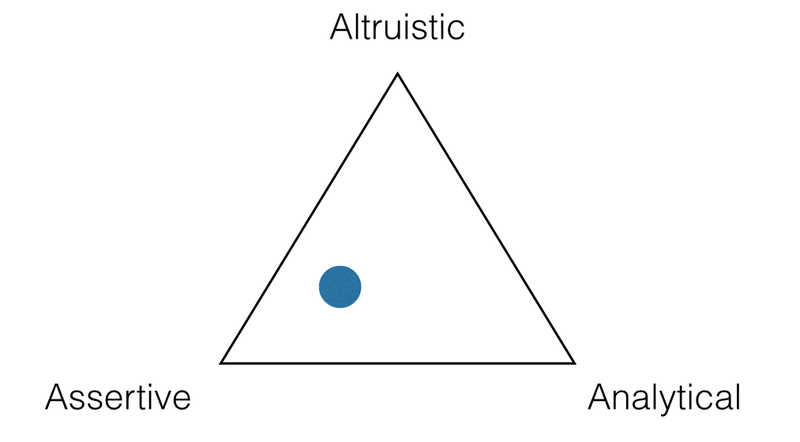 The placing of the dot in the triangle generates three items of quantitative data. In terms of complexity, what we now have is distributed cognition, where people are adding layers of meaning to their answers, as opposed to the content being interpreted. Because the data does not suffer from disintermediation, i.e. 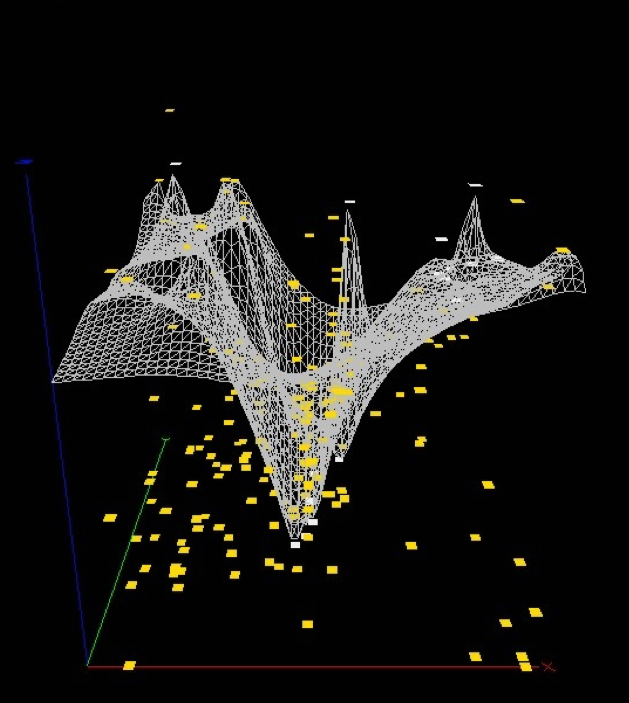 filtered by some form of analysis, the data can be visualised using complex representations, such as fitness landscapes, which can store thousands of stories. The removal of intermediaries also allows the original material to be easily accessed in a variety of forms by decision makers. In this landscape diagram for example, it is now possible to identify belief systems, and this approach to research is in direct contrast to traditional employee satisfaction surveys and customer questionnaires, because it allows the continuous free capture of narrative with instant feedback. Sensemaker® software allows the interpretation of the capture of thousands of stories almost instantaneously, whereas traditional research such as questionnaires and surveys often result in a delay of weeks or months before the data is available. If we come back to my module at Sustentare last week, I was teaching a group of HR professionals. In a few weeks I will share some research from their thoughts on the value of developing sensemaking skills and an appreciation of complexity. But for now the main observation was how they described the current problems with leadership that they are facing. These problems are not unique to this particular group. I would categorise the current crisis in leadership as an inability to see. This is what makes Bertrand Russell’s observation so interesting. It is one thing to collect and analyse facts, but some people simply cannot see what is right in front of them. They are not able to make sense of rapidly dynamic complex scenarios, and they are using outdated tools to understand how to really gain deep knowledge and wisdom by understanding the fragments of stories that people narrate. SenseMaker® is a software ecology which integrates decision support, research, monitoring and knowledge management. It is available from Cognitive Edge from which the extracts in this article about the software come.